What Else Can I Expect From an Online Information Security Degree Program? As cyberattacks increase in frequency and scope, so does the demand for information systems security specialists. With a job growth rate of 18%, the field of cybersecurity is one of the fastest-growing occupational sectors in the nation. If you're an innovative thinker who loves being at the forefront of technology, a career in information systems security might be in your future! Earning a bachelor's degree is the first step to finding a job in this exciting and lucrative field. WHAT IS AN INFORMATION ASSURANCE DEGREE? An information systems security degree teaches students how to protect sensitive information for organizations. Learners are taught how to use the latest technology to prevent cyberattacks. Read more here..
SHOULD I GET A DEGREE IN INFORMATION INSURANCE? Students with a strong background in technology will do well in an information security program. Learners without a technology background me be required to complete prerequisite courses. Read more here..
Information assurance refers to the processes involved with protecting information systems, such as computer systems and networks. Read more here..
IS INFORMATION ASSURANCE A GOOD CAREER? The Bureau of Labor Statistics projects many technology-related careers to grow, and graduates of information assurance programs are qualified for many lucrative careers. Read more here..
WHAT DOES AN INFORMATION ASSURANCE ANALYST DO? Information assurance analysts identify risks within software and hardware systems. They protect company, employee, and customer information from unauthorized access. Read more here.. The best online degree in information systems security is one that equips you for success in this rapidly growing and lucrative field. Whether you're aiming for a career in digital forensics or fascinated by ethical hacking, an online information security degree program can give you the knowledge and skills most sought after by employers. Covering topics from network architecture to cryptography, core courses address concepts integral to the field of information security. Through these courses, students will develop a set of skills that can be applied to numerous aspects of information technology. Some programs also offer concentrated learning tracks for those interested in one of information security's many subfields. The online format is ideal for information technology coursework, offering hands-on experience in security application development, modeling, and other concepts, through virtual labs and interactive exercises. Many programs culminate in a capstone course that allows students to demonstrate their acquired skills and knowledge. Located in Salt Lake City, Utah, Western Governors University was founded in 1995 and offers an information security degree online that delivers the latest security management skills and provides students with the opportunity to earn eight industry certifications, including Cisco Certified Network Associate. WGU’s bachelor of science in information technology with a security concentration is asynchronous and takes an average of two to three years to complete. The degree is designed for IT managers and professionals looking to further their career through official accreditation. WGU is the first school in the United States to adopt a competency-based approach to their degree programs, which enables those who are knowledgeable in a particular subject area to make accelerated progress towards their degree by demonstrating competency or expertise in established skills. 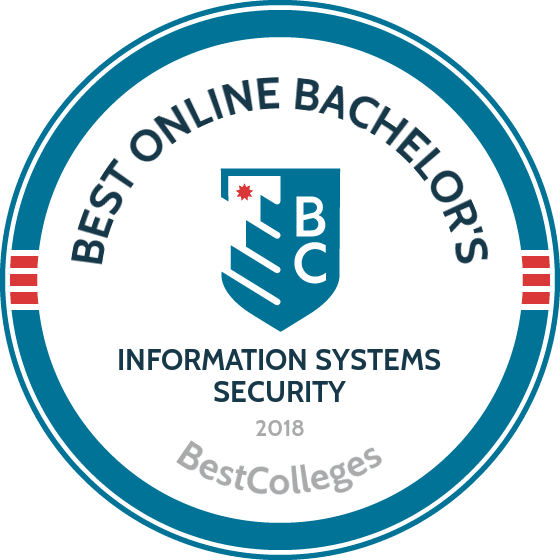 The curriculum for this online information security degree totals 123 "competency units" and includes general education requirements as well as major courses in interconnecting network devices, data management, operating systems, and scripting and programming. Students must also complete a capstone project, a comprehensive experience that lets them synthesize all they’ve learned by applying their skills to a real-world situation. Through independent research and work, they can propose a solution to an actual challenge faced in their place of business or in the larger field of information technology. Tuition, which has not changed since 2008, is priced at a flat rate each term and the school makes a number of financial aid opportunities available to students, including private scholarships and tuition assistance for military personnel and their families. Students may transfer credits for associate degrees, undergraduate courses, and IT certifications. WGU assigns grades as pass or not pass (pass is equivalent to a "B" or better). Applicants must hold an associate degree in IT, transferable IT certifications (within the last five years), and three years IT work experience. Founded in 1971, Albany, New York's Excelsior College serves nontraditional learners. For example, the school tailors its programming to meet the needs of working adults and 75% of its students are employed full-time. With the ever-increasing need for information assurance in today's digital world, Excelsior offers an online information security degree in the form of a bachelor’s in information technology that enables students to analyze electronic information security and risks in order to protect an individual or organization’s data assets in a secure and ethical manner. Excelsior is recognized as a National Center of Academic Excellence in Cyber Defense Education by the National Security Agency (NSA) and the Department of Homeland Security, and its faculty consists of seasoned professionals with the knowledge and professional connections to help students succeed. This 120-credit program requires 60 credits in arts and sciences, 48 in technology, and 12 in free electives. In addition to the school's arts and sciences general education requirements, students complete major core courses in topics like database concepts, computer systems architecture, and data communications and networking. Learners also complete a number of advanced courses in the information security concentration and may use their electives to further develop these skills or pursue other complementary coursework. Courses are taught asynchronously and the program has no on-campus requirements. Because Excelsior’s information security degree online program is targeted toward working adults, the school administers a notably generous credit transfer policy. In addition to receiving maximum transfer credit for prior college work, students have the opportunity to gain credit for applicable corporate training and military experience. The school prices tuition at a flat per credit rate for all distance learners and students have access to a number of financial aid options, including scholarships and discounts for veterans, active military personnel, and their families. Payment plans, including monthly payments, are another option for students who seek to better manage tuition costs. Nebraska's Bellevue University offers an excellent online information security degree program focused on necessary fundamental technical knowledge and their applications in a variety of cyber security environments. By integrating theory with applied hands-on learning, students learn to identify vulnerabilities and threats in order to troubleshoot programs as they arise and implement ethical and secure information technology measures for individual clients or entire corporations. This 127-credit curriculum includes 36 major, 46 electives, and 36 general education credits. Courses in the major include topics in securing access control, cryptography, and cyber investigations and forensics. Students complete a large number of elective hours, which they use to pursue more advanced coursework in cybersecurity or complete a minor. Additionally, all students must complete three courses of the school's unique Kirkpatrick Signature Series. The school's program is asynchronous and designed for consistent interaction between online student peers and faculty, and students select between a traditional online format and an accelerated cohort model, where they complete their degree with a consistent group of peers, thereby building community and developing professional relationships. Tuition for this information security degree online program is priced at an affordable per-credit rate for all online students and financial assistance is available. Classes begin throughout the year. Bellevue is nationally accredited by the Higher Learning Commission and is designated as a National Center of Academic Excellence in Information Assurance/Cybersecurity by the NSA and the Department of Homeland Security. Distance learners enjoy access to a number of student services and programs, including subject tutoring and help through the the Bellevue Writing Center and Study Skills Center. Founded in 1969, the University of Illinois at Springfield enrolls over 5,000 students annually and offers a number of academic programs, including an accredited information security online degree. Designed for students seeking careers in system analysis, information systems security, or network administration, UIS’s bachelor’s in information security systems trains students to understand and communicate best security practices and ethics as well as design and implement security systems for individual clients or whole companies. With fundamental knowledge and skills in-hand, graduates are also well-equipped to pursue further education at the graduate or doctorate level. The program's 120-credit curriculum is certified by two of the leading professional organizations in the field: the Committee on National Security Systems and the NSA. Only 30 of these hours need to be completed at UIS, meaning this online information security degree is perfect for those with previous college experience. Course topics include systems programming languages, windows network administration, and computer ethics, to name a few. Students must also complete an exit assessment and a capstone course in systems security and information assurance where students work in groups to design and implement a complete IT security system based on case studies. There are also a number of elective hours embedded in the degree plan, which enables students to craft a concentration area or pursue more advanced coursework in an established area of study. All applicants must complete a statement of purpose form, and must have completed the equivalent of two semesters of Java programming and one semester of calculus, discrete or finite mathematics, and statistics. If students plan to pursue further education or begin a career in a scientific field, the university recommends taking an additional semester of calculus. Tuition can be paid per credit hour or by semester and scholarships are available, including institutional merit-based awards for transfer students. The state's only metropolitan university, The University of Nebraska at Omaha (UNO) enrolls approximately 10,000 full-time students within its six academic colleges. While each of UNO's colleges is "dedicated to providing rigorous academic programs," the College of Information Science and Technology (IS&T) creates leaders specifically equipped to address the ongoing challenges of a global economy. Featured in this college is the 120-credit online BS in management information systems. UNO's online BS in management information systems teaches students how to solve challenges in today's business world through computers and technology systems. Students in this program take core courses in information security, web development, computer programming, computer science, applied statistics, and IT ethics. Other areas of focus include project management, information system analysis, and system design and implementation. Finally, students in this program must specialize in two secondary fields, each consisting of 12 credit hours from the same subject. A unique aspect of UNO's information security degree is an internship that matches juniors and seniors with community businesses. An applicant for this program needs to have taken the TOEFL or IELTS (if English is not one's native language), be at least 21 years old, and have earned a high school diploma or GED. Located in Adelphi, the University of Maryland University College offers an bachelor of science in cybersecurity management and policy designed for IT professionals seeking advancement into management positions, ranging from information systems supervisor, systems analyst, or functional liaison, to information assurance manager or IT project manager. Program faculty includes a chief information officer, the owner of a successful private company in the industry, and a head of systems engineering. The 120-credit curriculum instructs students in best practices for protecting the critical information of organizations, integrating security and risk management methods, and securing information systems. Courses are divided into general education requirements, major courses, and electives. This innovative, world-class program uses a multidisciplinary approach, drawing from fields such as management, law, science, business, technology, and psychology, to provide students with the most current knowledge and skills required to protect critical cyber infrastructure and assets. The program also offers a 3-credit upper level elective -- Cybersecurity for Leaders and Managers -- which is open to all students within the university and provides an overview of cybersecurity concepts including privacy and data security. Students must complete 46 credits of electives, which they use to pursue more advanced coursework in their BS degree or complete a minor in a related field or non-related topic of interest. The school's UMUC program are also prepares students to sit for the globally recognized CompTIA Network+, CompTIA Security+, and ISC(2) CISSP certifications, enabling students to stand out in a competitive job environment. Regardless of location, UMUC students benefit from access to a variety of services, including academic advising and career assistance. This information security degree online program is available asynchronously online or in a hybrid format. Tuition is priced per credit based on a student’s residency status, with military personnel receiving a steep discount, and students may transfer up to 90 credits, significantly reducing the cost of the degree. The school makes interest-free, monthly payment plans available. Distance students also have access to a number of financial aid opportunities, including institutional scholarships based on merit and need. Located in New Britain, Connecticut, Charter Oak State College was founded in 1973 and holds national and regional accreditation by the New England Association of Schools and Colleges. COSC offers a number of academic programs, including an online information security degree for students with computer backgrounds seeking careers in information assurance. Designed for students with some background in computers, this bachelor of science in cybersecurity arms students with the skills and knowledge necessary to be part of the IT protection and prevention workforce in positions like ethical hacker, cryptanalyst, and web application developer. The degree plan totals 120 credit hours: a minimum of 40 in general education requirements, at least 45 in the major, and the remainder in guided electives, chosen with the help of an academic advisor. Coursework in cybersecurity covers risk management, network architectures, digital forensics, cyber policies, and other classes focused on training students in risk management principles towards the assessment of threats, vulnerabilities, and countermeasures in online information systems. Students complete a cornerstone seminar during their first semester and a capstone requirement rounds out the curriculum, tasking students with synthesizing all they’ve learned to create a total cybersecurity measure based on case studies and independent research. Students also have a lot of freedom, through their electives, to forge an area of specialization or pursue a complementary secondary field of study. Tuition is based on a student’s residency status, though both rates are very affordable, and this accredited information security online degree accepts applications throughout the year. A number of scholarships are available, including privately endowed awards and specific funds allocated for students transferring in from a community college. COSC also offers a prior learning assessment, which provides degree credits for portfolios, training, exams, professional licenses, and credentials. For example, students receive credit hours for holding a Certified Information Systems Security Professional designation. Located in Burlington, Vermont, Champlain College was founded in 1878 and started offering online degree programs in the mid-1990s. The school’s online information security degree program is focused on experiential learning and offers simulations through a virtual laboratory. Unlike many of its peers, the school prioritizes its learning philosophy on problem-solving rather than student testing, cultivating lasting skills that give graduates an adaptive advantage as technology rapidly changes and global digital landscapes grow in complexity. Champlain is accredited by the New England Association of Schools and Colleges, and is designated a Center of Academic Excellence by the NSA and the Department of Homeland Security. Champlain's bachelor of science in cyber security degree totals 120 credit hours, 90 of which may be transferred from previous college work or through professional experience and training. The major is comprehensive and elective hours are funneled into advanced coursework in the field, so students leave the program knowing they have received the training necessary to land that dream job or pursue further education. Courses are completed in general education requirements as well as topics like foundations of cyber security, ethical hacking, and cybersecurity policy analysis and implementation. Students can also earn a certificate prior to graduation, in subjects such as computer forensics and digital investigations, computer networking, cybersecurity, Linux administration, or system administration, enabling them to further bolster their career prospects. Designed for busy adults, Champlain’s information security degree online program is completely asynchronous, with no on-campus requirements. Courses are offered in a seven-week structure, which allows for flexibility as well as acceleration for students who want to earn their degree as soon as possible. Champlain prices tuition per credit hour, a rate that remains the same for all distance learners. The school requires a minimum overall GPA of 2.5 for admission and does not require an application fee. The program begins on six start dates per year. Administered by its Cole College of Business, northwest Georgia’s Kennesaw State University offers an online information security degree program. KSU’s program stands out among other programs of its kind in part because it is one of few that grants a bachelor’s of business administration in information security and assurance. Designed for students of all backgrounds, this program focuses on the tools necessary for work in the field. The curriculum totals 120 credit hours and includes general education, business core, and information technology major requirements. The degree plan features a number of embedded open electives. IT courses aim to provide students with real-world experience to analyze and secure information systems. Topics include client systems security, perimeter defense, and management of information security in a global environment. Enrolled students take traditional management and finance classes that prepare them for a variety of supervisory positions upon graduation, experience not often gained from a conventional bachelor of science degree. One of the best accredited information security online degrees in the United States, KSU’s program prepares its students to tackle the ever-evolving threats faced by contemporary commercial information systems. Online courses are taught by the same expert faculty who teach on-campus sessions, and all courses are reviewed by the school every three years to ensure they meet the changing professional demands of the information security field. While the school delivers most coursework asynchronously, some classes do require students to participate in the virtual classroom in real-time (usually during the evening). KSU charges tuition by credit hour and makes available a variety of grants and scholarships. Online students enjoy priority registration in addition to academic services like tutoring and advising. Located in New Castle, Delaware, Wilmington University offers 90 fully remote degrees, concentrations, and certifications. Among the school's catalog is an online network security degree program designed to instruct students on the ethical standards of data, best practices and methods, and the application of technical knowledge. By earning a bachelor of science in computer and network security at Wilmington, students prepared to work in this rapidly growing field, whether as part of a federal agency or in an organization in the private sector. Wilmington's degree plan consists of 120 credit hours in general education, support core, security core, and mixed electives. Courses in the major include topics like cyber law, advanced network management, data security, and cryptography. Students must complete 15 hours of free electives, which they can use to pursue a minor or to pursue advanced cybersecurity coursework. The program also provides credentials in digital information security and qualifies students for certifications such as certified information system auditor, certified information systems security professional, security+, and CompTIA Network+. Wilmington also offers a Community and Academic Partnership Co-op program, which enables students to complete up to six CNS degree credits through applicable work or volunteer experience. Wilmington offers courses asynchronously, so students may pursue their work at their own pace. For additional flexibility, classes in this network security online degree program are delivered in 15-week semester or seven-week block formats. Wilmington enforces a minimum grade policy: students who earn lower than a "C-" in a required course must retake it. Distance learners, regardless of residency status, pay the same affordable per-credit tuition rate and may transfer up to 90 credits from previous college-level work to minimize the cost of their degree. Applicants who hold an accredited associate degree may pursue the CNS bachelor's as part of a completion track, thereby eliminating the non-major coursework from their list of requirements. Located in Madison, South Dakota, Dakota State University offers a fully online network security degree program that combines basic networking and security skills crucial to the study of, for example, cybersecurity, virtualization, and digital forensics with a solid understanding of business management ideas and best practices. This approach enables learners to become effective communicators and leaders in a variety of career environments. DSU faculty are experts in their specialized fields and work to cultivate an open mentoring relationship. The curriculum for this bachelor of science in network and security administration totals 120 credit hours of general education, major, and elective requirements. Course topics in the major include operating environments, database management systems, and defensive network security, to name a few. DSU is well-known for its virtual labs and IT students can take advantage of the institution's programs to gain hands-on experience by practicing defensive hacking and network forensics in a controlled environment. Eligible students may also opt to pursue their BS degree at an accelerated pace. While the majority of coursework in DSU's network security online degree program is facilitated asynchronously through the D2L platform, certain courses do require real-time participation. The school encourages collaboration between online and on-campus students by assigning shared projects, an approach that helps foster a sense of community regardless of a student’s learning method. Classes typically contain no more than 25 students and start dates occur during the spring, summer, and fall. DSU offers tuition at a "self-support rate," which allows students to pay by the hour with very few administrative and service fees (rather than a flat semester rate). Financial aid and scholarships are available to online students registered for a minimum of six credit hours and over 76% of DSU students receive some form of financial assistance. Located in Philadelphia, Drexel University offers a variety of academic programs, including an online information security degree program. Designed for individuals already working in the IT field or those with an associate degree or equivalent coursework, the school offers this bachelor of science in computing and security technology with a concentration in computing security (BSCST) asynchronously, enabling students to pursue coursework at their own pace. Completion of this program often advances careers and salaries, and coursework prepares learners for additional certifications. This information security degree online curriculum is focused on teaching students to securely manage and implement IT infrastructure. Courses are organized in four 10-week quarters every year, allowing students to take more courses in a shorter time period, thereby accelerating their degree completion. In addition to the standard general education requirements, students must also complete coursework in network administration, social aspects of information systems, and security defense countermeasures, to name a few. The degree plan also contains elective hours, which students can use to pursue a minor in related areas like data science and software engineering, or even something outside the IT field. Drexel gives its students opportunities to test drive careers and gain professional experience through its co-op initiative facilitated by the Steinbright Career Development Center. Students with existing IT certifications -- including in A+, Oracle 9i DBA, Windows 2008+, and Cisco certified network associate -- can receive transferrable credits. Grades of "C" or higher may also be transferred, up to 113 quarter credits (one semester credit = 1.5 quarter credits at DU, with four 10-week quarters per year). Tuition is priced at a flat per credit rate for all students and new distance learners receive a 40% discount. The school makes special rates available for DU alumni, military, and partner organizations. Online students are eligible for financial aid. Degree applicants must have a minimum of 24 previous college credits less than 10 years old and an overall minimum GPA of 2.5. In 1866, Davenport University was established as a business school in Grand Rapids, Michigan by a former Union Army officer. Today, distance learners comprise 42% of DU’s student body and the school offers 50 completely remote degrees, including an online information security degree. The bachelor of science in cyber defense teaches students how to protect data from threats, prevent hacking, and secure cyber networks and activity. Through hands-on practice, students learn performance-based skills and knowledge sets in preparation for providing the best possible cyber security, whether in government or private industry settings. DU is one of 13 schools in the United States designated as a National Center of Digital Forensics Academic Excellence by the Defense Cyber Crime Center Academic Cyber Curriculum Alliance. It is a distinction that recognizes the excellence of its information security degree online curriculum. Consisting of 120 credit hours, the degree plan includes 45 hours in major coursework to Perl/Python scripting, the Unix operating system, and Windows digital forensics. Students must also satisfy a College of Technology capstone requirement where they demonstrate proficiency by creating a complete cyber security plan based on case study analysis and independent research. Students may choose to pursue a specialization in health care information and assurance or information assurance to further enhance their degree. Additionally, students may choose to add an additional specialization in mathematical modeling by taking courses in advanced calculus and differential equations (a stellar option for those who want to pursue further education at the graduate or doctoral level). Davenport prices tuition by credit hour and the school stands out among other universities by offering a 33% discount for online students residing outside Michigan. Course credit for some professional certifications is available, along with financial aid like scholarships and tuition assistance for military personnel and their families. Located in Dobbs Ferry, New York, Mercy College is a Christian college that offers over 40 internet-based programs, including an online information security degree. Designed to teach students the tools they need to work in the rapidly growing IT security field, from implementing and configuring new software and technologies to providing secure protection and disaster recovery. Mercy’s bachelor of science in cybersecurity program is recognized by the NSA and the Department of Homeland Security for its excellence in information assurance education. Facilitated by the School of Liberal Arts, this information security degree online program requires the completion of 120 credits, including 60 credits in general education, 48 in the cybersecurity core, and 12 in electives. Major courses include such topics as penetration testing and ethical hacking, forensic and electronic discovery, and cryptography and computer security. Students who complete the program are equipped to identify risks, design and secure systems, and to understand information encryption and decryption. The school also offers a dual degree option with a BS and an MS which takes five years to complete (in comparison, the individual bachelor’s is generally completed by students in about four years). Program application requirements include a transcript of high school or applicable college-level work and letters of recommendations. Mercy is an SAT/ACT optional institution. The school recommends that students who are interested in the cybersecurity program have courses in college algebra and precalculus under their belt. Students who have not completed these courses must take them in addition to their other degree requirements. Students may transfer up to 75 credits from a two-year institution and 90 credits from a four-year university. Students can pay tuition per credit if pursuing their degree part-time while full-time learners must pay per term. Mercy makes financial aid available, including awards for specific academic programs and scholarships for incoming first-year students. The school's online students enjoy access to a variety of academic services, like an online learning center, advising, and career services. Located in Romeoville, Illinois, Lewis University offers its students a remote bachelor of science in information security and risk management. This accelerated, asynchronous online information security degree program imparts management theory and technical knowledge to students in the areas of ethical hacking, computer forensics, IT operations, and security incidents. It prepares students for industry certifications such as security+, certified information systems security professional, certified ethical hacker, and access data certified forensics examiner. Lewis is recognized as a National Center of Academic Excellence in Information Assurance Education by the NSA and the Department of Homeland Security. Its curriculum, which totals 120 credit hours, is designed with care and regularly updated to meet evolving industry standards. Major courses include topics in business communication in the digital age, computer forensics, and database management systems, to name a few. Students must also complete a comprehensive exam in order to earn their degree. This major field test is designed by the Educational Testing Service and measures student learning outcomes in their major field of study when compared to students in similar programs at other colleges and universities. The degree plan also consists of general education requirements, which may be satisfied through previous college-level work. Additionally, Lewis offers students the opportunity to pursue a fast-track master's in information security by adding 26 credit hours to their program, increasing their studies by approximately 18 months. Tuition for this accredited information security online degree is priced at a fixed per-credit rate and the school makes financial aid available, including a generous award for eligible transfer students. Distance learners enjoy 24/7 online access to Lewis's CloudLab, where students use virtual machines to experiment with topics such as database management, hacking, forensics, and programming. Conventional academic services, such as advising, tutoring, and career assistance, are also available. The accelerated degree is only available for adult students who have earned at least 30 hours worth of college credit and can demonstrate evidence of significant work experience or military training. Computer forensics: This course offers a broad overview of the methods and tools used to investigate computer-related crimes. Students learn how to obtain digital evidence for use in court as they perform basic investigations on numerous operating systems. Coursework emphasizes the importance of good practice guidelines in collecting court-admissible information. Information and security planning: Addressing crucial topics such as network security, encryption, and acceptable use, this course examines methods of constructing guidelines for maintaining digital security. Students may earn hands-on experience by constructing and implementing their own information security program as they become acquainted with common standards in digital risk management. Ethical hacking: Students assigned to this course will gain a skillset in high demands as they learn popular techniques in penetration testing for security assessment. Coursework demonstrates how intruders exploit vulnerabilities to infiltrate a system, and how this can be prevented. Topics covered include network scanning, enumeration, and issues in cryptography. HOW LONG DOES IT TAKE TO GET AN ONLINE BACHELOR'S IN INFORMATION SYSTEMS SECURITY? The average online information security degree program consists of around 120 credit hours, but there are several factors that affect the length of a degree. While most students complete their information assurance degree online in two to four years, completion time depends heavily on whether a program is individually paced or taught in a cohort-based format. Designed for busy people balancing education with professional and personal obligations, asynchronous, or self-paced programs let students complete coursework when and where it's most convenient. Broadly-defined deadlines and accelerated courses allow organized, focused students to finish their degrees quickly. Conversely, cohort learning requires students to be online at specified times, as lectures and discussions are delivered to a group of online “classmates.” Cohort-based programs emphasize cooperative learning, and may involve participation in group projects or forums. Although they take longer to complete, many students prefer the more structured format of cohort learning degree programs. If you've been researching online degree programs, you've undoubtedly noticed the term accredited on many college websites. Accredited institutions are those that meet quality standards defined by an external accrediting organization. Depending on the assessing organization, schools can be regionally or nationally accredited. While these designations may not seem important, they can have a profound influence on your academic career. Nonprofit, academically-focused schools such as state universities are most often regionally accredited, while for-profit vocational schools typically receive national accreditation. Credits earned at regionally accredited institutions transfer easily to other regionally and nationally accredited schools, but this is rarely the case for those earned through nationally accredited programs. If transferring schools might be in your future, selecting a regionally accredited institution should be a priority. Additionally, most corporate tuition reimbursement plans extend exclusively to regionally accredited programs. Through the accreditation process, the U.S. Department of Education determines which institutions are eligible to receive federal funding. While this branch of the government doesn't accredit schools itself, it does rely on information collected from organizations like the Council for Higher Education Accreditation. Consisting of representatives from universities around the country, CHEA ensures that regional and national accrediting bodies are adhering to standards. Along with a wealth of resources on the accreditation process, CHEA offers an extensive database of accredited institutions around the country. Does having a bachelor's degree really lead to a better salary? There are numerous factors that influence annual median pay, including location, company policies, and professional experience, but few variables impact earnings as much as level of education. Even among industry veterans, higher salaries are strongly correlated with higher education. Using data gleaned from PayScale, the table below demonstrates just how much having a bachelor's degree can affect earnings. While salaries depend heavily on individual employers as well as professional experience, even entry-level jobs in the field of information systems security can be highly lucrative. Using data from PayScale, the following table features several careers and specialized positions attainable with an online network security degree, as well as the average salary for each. Information Security Analyst: Information security analysts design and implement plans that protect companies and organizations from hackers. The changing nature and frequency of cyberattacks has given this occupation one of the highest job growth rates in the country, and the demand for experts in the field has increased exponentially. Computer and Information Systems Manager: Often known as IT managers, these experts ensure the security of a business or organization's network while directing all computer-related activities. IT managers assess hardware and software to determine any necessary upgrades, and implement new technologies as required. Network and Computer Systems Administrator: Tasked with the day-to-day maintenance of computer networks, these administrators provide organizations with crucial technical support. Network administrators must be familiar with a range of network types and the technical and security problems commonly encountered with each one. Some assist network architects in program design. Computer Systems Analyst: Combining aspects of business and information technology, computer systems analysts assess an organization's computer infrastructure to determine the most beneficial and secure hardware and software upgrades. Through data modelling and flowcharts, they identify an organization's technological needs and perform cost-benefit analyses to determine the most cost-efficient way of meeting them. Database Administrator: Database administrators are charged with maintaining the security and accessibility of organizational data through the use of specialized software. Some specialize in systems architecture and program writing, while others focus on the maintenance of particular applications. Information Systems Security Association: This nonprofit organization is committed to advancing cybersecurity professionals through education and leadership opportunities. Members may join local special interest groups, attend international conferences, or enroll in educational courses. International Information Systems Security Certification Consortium: Offering 10 different certification programs, this organization also maintains a large virtual library of materials pertaining to information security. Students enrolled in participating college programs may be able to earn credit for attending events and webinars. Association of Information Technology Professionals: The premier organization for IT professionals worldwide, this society extends numerous benefits to student members, including scholarships and career fairs. Paying for an online information security degree might seem overwhelming at first but, fortunately, help is available. Filling out a FAFSA form can help to determine if you're eligible for federal grants, student loans, or scholarships. An increasing demand for qualified cybersecurity professionals has prompted many businesses and professional organizations to offer scholarships for students pursuing degrees in information security. Many of these scholarships are available to distance learners as well as their traditional counterparts.